Panasonic is no stranger when it comes to rolling out notebooks as well as tablets that are of the tough variety, especially when we are talking about the Toughpad. We have come across various Toughpads in the past, and boy, were they ever able to live up to their reputation. 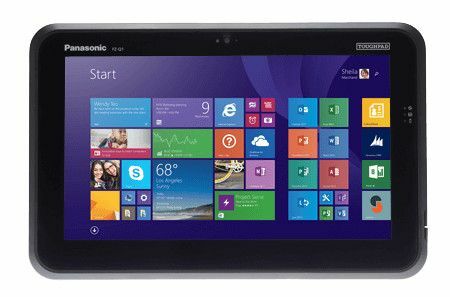 In fact, the most recent member of the Toughpad family of enterprise-grade ruggedized tablet devices was announced not too long ago, where it will be powered by an Intel processor with Windows 8.1 Pro as the operating system of choice, as the device bears the name Panasonic Toughpad FZ-Q1. The Panasonic Toughpad FZ-Q1 happens to be a business-grade tablet which has been specially designed for the highly mobile field worker, regardless of whether they are in the government or private sector, and it caters to those who need a device more durable than a consumer tablet. Some of the applications happen to include code enforcement, home health, transportation, POS retail environments, and small business applications, among others. There will be a couple of configurations available to meet varying market needs, where a performance version running on an Intel Core i5-4302Y vPro processor is there for the taking in addition to a standard model with an Intel Celeron processor N2807. Specially built for light duty field work, it sports a shock absorbing case as well as a magnesium alloy chassis, allowing the device to withstand drops, where there is also a fanless design and it remains resistant to dirt and dust. This makes it the perfect example of a mobile computing companion for the highly mobile worker who needs a semi-rugged device. Other hardware specifications include a Full HD, 350 nit, 10 finger touch, screen with an anti-reflective (AR) screen treatment, an easy grip bottom cover, integrated stylus, fast charging battery that outperforms consumer grade tablets. In terms of connectivity, the Toughpad FZ-Q1 will be no slouch, either, as it boasts of Wi-Fi, Bluetooth, an optional 4G LTE multi carrier with satellite GPS. There will also be USB 3.0, a MicroSDXC memory card slot, a 2MP webcam, an 8MP camera at th back, and integrated options for insertable or contactless SmartCard readers. The Toughpad FZ-Q1 is tipped to arrive later this March for a recommended retail price of $1,699 for the Performance model and $999 for the Standard model.